During the 1980’s there was no more fearless critic of the modern Democrat Party than President Reagan’s U.N. 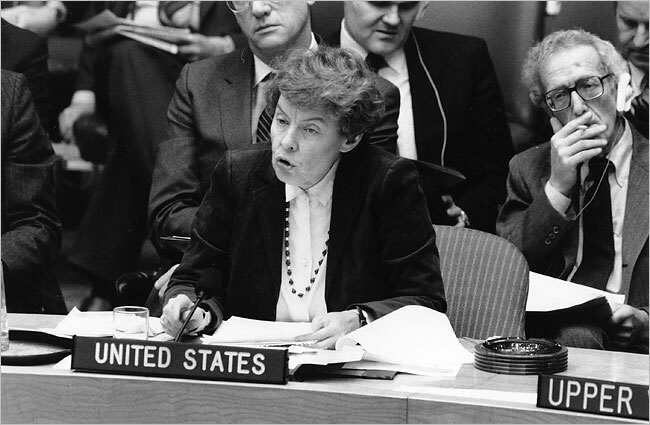 Ambassador, Dr. Jeane Kirkpatrick. A former socialist in her youth, and a registered Democrat for most of her adult life, it was Ambassador Kirkpatrick at the Republican National Convention in 1984 who famously labeled the Democrats as the “blame America first” crowd. They had, she expounded, become soft on communism and freedom and abandoned the party’s historic anti-communist foreign policy championed by liberal leaders such as President Truman and Senator Henry (Scoop) Jackson of Washington State. In truth, Dr. Kirkpatrick was being publicly kind. The Democratic Party has long been the safe harbor (along with the universities) for not only hard left radicals and socialists, but communists from the Roosevelt Administration forward. The Vietnam War and the anti-war movement of the 1960’s and 70’s brought the violent radical left into the Democratic Party and provided a toehold of legitimacy for the hard left and the “democratic socialist” movement. Now, the Democratic Party electoral debacle of 2016 has provided a unique political opportunity for the radical left to officially capture the center of the Democratic Party, even though they long ago did so politically. Senators Sanders, Warren, Booker, Harris, and Gillibrand, among others, and a herd of members in the House and potential members, such as the new darling of the radicals, the bizarre Alexandria Ocasio-Cortez from the Bronx, are now the public face of the Democratic Socialists in fact if not in name. Their common strategy seems to be regurgitating and promoting every failed crackpot idea that has been trotted out for the last one hundred years by the worldwide socialist movement and the trail of misery they have left behind. In other times, this crop of wannbe presidents and would be “leaders” – collectively as lightweight as the toenail on a gnat – would be laughed off the national stage for their preposterous rhetoric on open borders, dismantling ICE, letting violent criminals out of prison, Medicare for all, and implementing massive tax increases. But these are not other times and these radicals own a national party, egged on by the national mainstream media and an academic establishment whose own radical politics is well documented. The “blame America first” party of Ambassador Kirkpatrick’s era is all grown up. It is now the “hate America” crowd, with whom rational discussion, much less bipartisanship on major policy is no longer possible. The radical policy prescriptions and the long term agendas that the far left have long promoted in careful, camouflaged language, such as “fundamentally transforming” the nation, are now being touted as serious mainstream policy in public. It allows the voters to see clearly just of how extreme these polices are, and to judge for themselves whether socialist dogma and the ideals of personal liberty, especially free speech and free exercise of religion, can even coexist. Inexplicably, the organized Republican Party and many conservatives appear unwilling or unable to engage in a bare-knuckle public explanation, education and condemnation of the new national Democratic Socialist party, and its direct threat to basic freedoms, economic prosperity, the national defense and the rule of law. However, even if the Republicans want to hide from the fight, the fact remains that this is the most critically urgent, demanding and essential issue or our time; can individual liberty survive, or will we surrender to mob rule? The task of mounting a serious opposition will evidently fall not to our elected representatives, but to ourselves. Perversely, defending freedom never used to be controversial. There was once a common baseline in both history and civics that taught the basics of why the United States has a Constitution, and the how’s and why’s of the Bill of Rights, and most importantly the role of faith in the nation’s history. But, no more. This is the reason that I write commentary from the chaotic intersection of faith, culture and politics. We are not a people defined by our culture and politics. We are, and always have been, a people defined by our faith upon which the culture and politics ride. The American Revolution established that individual freedom and liberty were natural rights bestowed by an Almighty God, not transitory or circumstantial benefits from a mortal ruler or impermanent government, benevolent or otherwise. Our Founding documents gives no one the power to barter away the liberties fixed to us by the Author of Time, for the transient promises of mere men, or the petty gods of the moment. Since the first days of the Republic there has been a war against God-ordained freedom. Armies of philosophers, academics, tycoons, and power hungry politicians and their sycophants have attempted to re-interpret, re-configure or discount the central premises of the Founding documents. Many were simply driven by the lust to power and wealth with no real ideology beyond their own interest and greed, who possess no confining boundaries of conscience or integrity. Still others who seek to dismantle the Constitutional centerpiece of unalienable rights want to control every citizen through limitless restraints, based on the certainty of their own moral purpose and rightness for which they along possess the moral clarity to envision. This is why any form of socialism or tyranny is inherently evil, and virulently hostile to faith and the idea of God-granted, or natural rights. They all share an ideology based on the ageless lie that man’s plan can replace God’s plan, and that we can be our “own gods.” There is no degree, no variety, nor any measure of the socialistic construct that is not organized around this central idea. These lies put in practice progressively cannibalize the rights of all to establish a perverted economic and social “order,” always requiring the martyrdom of both personal independence and individual rights to achieve “real” equality – even though that proposed “order” exists nowhere in the natural associations of men or the natural world. And, sooner rather than latter, every form of radicalism turns their attack on society into an assault on faith in God and they use force of the “law” and inevitably the force of arms in an attempt to crush its Ancient precepts. The alarm bells for human liberty are ringing all across the western democracies, where parliamentary governments, never anchored to God-ordained rights, turn to mob rule. They are all in varying degrees attacking free speech, freedom of conscience, freedom of religion, freedom of association, and embracing cultural suicide. One is hard pressed to see a happy ending. In the United States, the very same pattern is being implemented less successfully, but relentlessly. Once again, it appears that America will have to save itself, and the rest of the free world. It will be the fight of our lives. I have only lately learned that my dear friend Evelyn Kerr passed away on June 1, 2018 after a battle with neuroendocrine Carcinoma. Evelyn and her husband, Dave, were extremely active conservatives in Rappahannock County, Virginia, where Evelyn had been the Chairman. My heart is broken with this news, and I would ask you to keep David in your prayers as he deals with this terrible loss. Evelyn, I will miss your wonderful smile, easy laugh and faithfulness.